If you’re expecting some alternative punk duo to greet you when you listen to this record, then think again. What you’ll find instead is a gorgeous blend of ethereal, folky indie pop sound that, well, sounds great as in-flight music. The band is actually made up of duo Eric Hillman and Brian Holl. Gathering influences from bands like Broken Social Scene, Radiohead, Bon Iver, Bjork and Aqualung; the duo echoes off the same laid-back, melodic and sometimes eclectic indie folk as their influences. 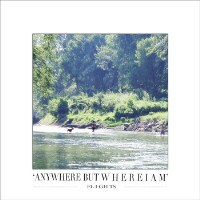 Anywhere But Where I Am comes with 13 tracks and was released over at BandCamp on New Years Day 2012. The Nashville, TN duo kicks things off with the song From The Lake To the Land. Starting serenely with simple guitars and a reflective mood, the track seems fit as a lullaby to a dark, dreary day. There’s a slight haunting feel to it, much like exploring a lush forest in the early morning. Meanwhile, title track Anywhere But Where I Am, is a personal favorite in the album. This one is a 3 minute instrumental piece featuring classical piano playing. It’s a gorgeous track that sparks both a hint of sadness and fond memories. On the other hand, final cut, Fake Arms, combines simple guitars and Damien Rice-sounding vocals. Overall, you’ll find some great company with this album. All of the songs feel as if they live and breathe with you and would make the perfect soundtrack to your everyday musings. The record is currently offered at a name-your-price option at BandCamp. Apart from the duo, it also features Charles Asch and Hitoshi Yamaguchi on cello and Ben Voce on violin. Take a listen and grab the download.